Join us for a summer of Math Mini Courses! Get prepared for next year! 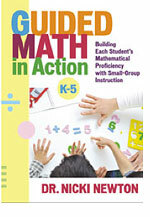 We’ll be exploring Guided Math 2.0, Math Running Records, The First 20 Days of Math Workshop, and Kindergarten Math. 4 different online mini-courses on demand! Each course stays up for a month! Enroll Today!